Meetings can be horrible, unproductive, and maddening. Can a high-tech conference table make them bearable? The New York Times R&D Lab have tackled the problem with the lab's latest project. The Semantic Listening Table is an attempt to make sense of the chaotic conversation. The table's particularly compelling because of the simplicity of the design. 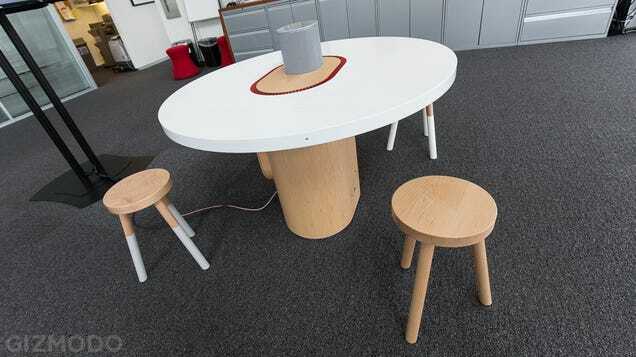 The table is round and about the right size for a small meeting room, but it's got a snazzier look you might expect to find in expensive design catalogue rather than in a midtown office. It's not an imposing object, but it's clear from the outset that it's different than just any other table. 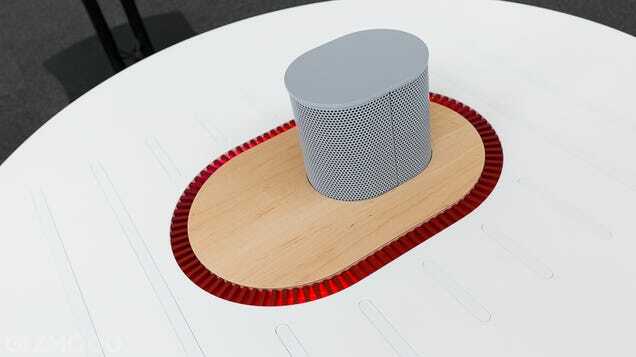 It's got a slick corian top and wooden base, plus a weird metallic grill in the middle, which looks a little be the supercharger protruding from the hood of a hot trod. When you talk, an inlaid ring of backlit red plastic flashes in time with your voice.